When a team puts together a 109-point season and has almost its entire roster back for the following season, there aren't too many questions surrounding the club. The St. Louis Blues ran into the Los Angeles Kings' juggernaut in the second round and lost in four games, ending a season that was as remarkable as it was surprising. What must the Blues do to get back to the postseason and beyond the second round? Here are some questions that could affect that. 1. How will Jaroslav Halak and Brian Elliott co-exist this season? -- The tandem was one of the most effective in NHL history last season, as it nearly had an even split in starts and combined for a 1.78 goals-against average and .932 save percentage. Halak went 26-12-7 in 46 starts and Elliott went 23-10-4 in 36 starts. Elliott found himself in the net far more often than expected because of Halak's early-season struggles, but the firing of coach Davis Payne and hiring of coach Ken Hitchock changed the fortunes of Halak and the Blues. During the postseason, Halak suffered an injury and made just two starts. Elliott took over and was in net for the Blues' four-game sweep at the hands of the Kings. Halak was signed to be the team's No. 1 goaltender and should see a bigger bulk of the work this season assuming he is healthy. But if he struggles, the Blues have a capable backup in Elliott who can get the job done. Depending on a lot of factors, it could be anything from a straight platoon to one of the goalies seizing control of the job of full-time. 2. How will Vladimir Tarasenko assimilate himself with the Blues? -- After four seasons in the KHL, the talented Tarasenko will begin his career in the NHL. The 20-year-old finished tied for eighth in the KHL in scoring last season with 23 goals and 47 points in 54 games after finishing tied for second in points with 11 in seven games as a member of Russia's gold-medal team at the 2011 World Junior Championships. Hitchock envisions Tarasenko playing somewhere in the top-nine. Whether a player is arriving from Russia, Sweden or the American Hockey League, a rookie's first season in the NHL is rarely an easy one. But if he can contribute offensively to a team that had a hard time scoring last year, he'll be a valuable piece to an already solid team. 3. Can Chris Stewart have a bounce-back season? -- After two straight 28-goal seasons, Chris Stewart plummeted to 15 goals and 30 points in 79 games. He had two goals in seven Stanley Cup Playoff games and was a healthy scratch during the postseason. The Blues gave up franchise defenseman Erik Johnson to land Stewart and defenseman Kevin Shattenkirk at the 2011 trade deadline, and Stewart had 15 goals in his first 26 games in St. Louis. Offense was a problem for the Blues last season, and Stewart rediscovering his scoring touch would go a long way toward remedying those woes. 4. Was last year a fluke or a harbinger of things to come? 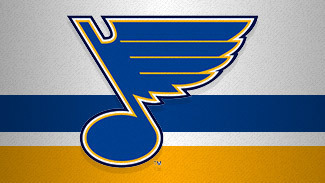 -- Let's be honest -- no one thought the St. Louis Blues were going to finish second the Western Conference last season. Even fewer people thought that when Payne was fired 13 games into the season and replaced with Hitchcock. In the previous six seasons, the Blues never finished higher than third in the Central Division, made one trip to the postseason and were swept away in four games. Was last year an instance of all the Blues' young players coming into their own all at once? Whether the Blues contend for the League's best record again remains to be seen, but their 109 points came in a season with three of their best players (David Perron, Andy McDonald, Alex Steen) missing a lot of time and Stewart playing so poorly he was seeing fourth-line minutes at times. With a solid young defense corps and two top goaltenders, the Blues should contend for a Cup if they can stay healthy. 5. Where will the offense come from this season? -- The Blues were 21st in goals last season and decided against bringing in a proven scorer during the offseason. Tarasenko will join the club, but he's hardly a Rick Nash acquisition or a Zach Parise or Alex Semin signing. So with the same cast of characters in 2012-13, the Blues will be relying on a full season from players who dealt with injuries last season and a resurgent campaign from Stewart. Perron (24 games, concussion), McDonald (57 games, concussion, shoulder), Steen (39 games, concussion) all had extended absences at varying points of the season. Perron, McDonald and Steen combined for 92 points in 125 games, an average of 0.74 points game, which is a big hole in the lineup when they are absent. Stewart will also be counted upon to return to his nearly 30-goal form of the previous two seasons. 6. Can Alex Pietrangelo win the Norris Trophy? -- There may not have been a more underrated player in the NHL last season than Pietrangelo. The 22-year-old finished fifth among defenseman in scoring with 51 points, which were the third-most on a Blues' team that had a hard time scoring goals. He averaged 24:43 of ice time, 16th-most in the NHL, and was plus-16. Despite his youth, he was routinely matched up against the opposition's top lines. With Nicklas Lidstrom retired, that's one less obstacle standing in Pietrangelo's way. The King City, Ontario, native will also benefit from a full season in Hitchcock's defensive system. The Norris voting can be based somewhat on reputation, but if Pietrangelo can improve slightly on his offensive numbers without losing his defensive edge, he could be on the short list for the award.